In this conversation the acclaimed production designer Sarah Greenwood talks about her craft, the research work that goes into the preparation stage of a new production, why every production is a period one, the famous Dunkirk beach scene in “Atonement”, her take on the advancement of digital tools, and “Anna Karenina” which is her latest collaboration with director Joe Wright, set decorator Katie Spencer and actors Jude Law and Keira Knightley. 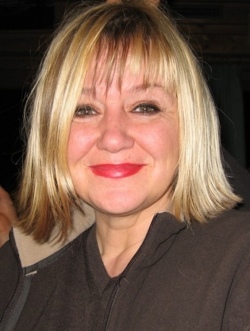 Sarah: I trained as a theater designer at the Wimbledon School of Arts, and I worked in theater for three years. I found it enjoyable, but it was strangely unsatisfying. There was something collaborative that was missing. When you work on a film set, you have a very close relationship with the director, and I certainly wasn’t finding that in the work I was doing in the theater. It also involved traveling a lot around the UK, and I quite liked being based in London, see my friends and earn proper money. So I sold my soul to the devil and started working at the BBC which actually was fantastic. At that time BBC had a massive art department, and it was an amazing training ground. So making the transformation from theater to film television was helped by the training we got there and the work that we did. Working for the BBC was fantastic. You could go two routes – assistant art director or set designing on small productions. I went down the second route, and started designing moving quickly onto “Later with Jools Holland”. I moved into the drama department working with some fantastic directors like Patrick Marbur on “After Miss Julie” and with Mike Barker on “The Tenant of Wildfell Hall”. And then with demise the design department at the BBC in the mid 1990’ss, I joined the freelance world and started working in film. That was the story of my transition from theater to television to film. I went backwards and forwards for a bit, and decided that I much prefer film. I’m much more suited to film design. I have friends who still work in theater, and I could never design as well as that. My design work in much more suited to film, and I’m happy to working in this medium. Set sketch for “Anna Karenina”, courtesy of Sarah Greenwood. Kirill: Do you see yourself going back to more restrained budgets of television productions? Sarah: I would like to say yes creatively, but financially probably not. The budgets were tight then and it was fine because you were going through them, but I would probably struggle a bit now with the scale of the budgets. But why not? Although going back to Theatre is a step to far, Joe Wright [director] just has come back to theater and wanted me to do it with him – two shows next year. I’ve chosen not to because conceptually that is so different. As much as theater design informs film design, being character-based and script-led, I think aesthetically they are so different now for me to go back and design theater. But to go back to television – as they say, never say never. There’s some brilliant television that’s done, particularly at the BBC. They do amazing things, but at the moment it’s probably not for me. Kirill: Do you think that you’ve been “spoiled” by the much bigger budgets of your recent films? Sarah: The bottom line is that there’s never enough money, no matter what your budget is or your scale. You never have enough time or enough money, which is fine,its the way. You can go from “Sherlock” which had a budget of $130M to “Anna Karenina” which had a budget of $25M, and they’re both equally short on time. There are compromises in both but, creatively good things often come out of those challenges that. If you tell me to go back to a television production with a budget of $2.5M, I’m sure I could do it, but that’s not the route that I’m going down at the moment. Equally, maybe in the future when I don’t want to be working away or stressing as much as the big productions demand I might want to change direction. Kirill: Do you think that the audiences in the UK and Europe are more interested in seeing period dramas than the American audiences? Sarah: Not necessarily. Actually, interestingly I think the American audiences are probably more interested in and sympathetic to this kind of production than the UK audiences. I think that the UK audiences are slightly cynical because they are drenched in it. There’s also something cyclical about it. Maybe it has to do with the economy, but at the moment the UK audiences are certainly loving “Downton Abbey” and “Upstairs, Downstairs”. You can call it “comfort viewing” as in “comfort eating” – roll over and it’s just lovely. I think it varies but I don’t know enough about the American audiences to really know what they like. Certainly over here sometimes the press is particularly cynical towards costume drama, which is good because it means you have to raise the bar very very high to be successful with it. This is one of the reasons why we didn’t go out and do a conventional Anna Karenina. I think that if we’d done that, we would’ve bored ourselves and bored the audience. We didn’t have enough resources to do something amazing, and it was going to be a pretty standard production, but as I said earlier when resources get tight we ended up doing it in a much more exciting and interesting way. 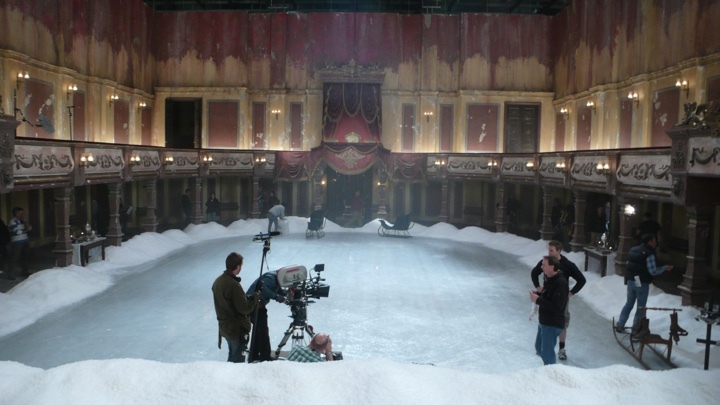 On the set of “Anna Karenina”, courtesy of Sarah Greenwood. Kirill: Everything is period, even if it’s set in the modern times. How do your approach researching a particular time when you start working on a new production? Sarah: You kind of completely consume yourself in the period and the story. As you say, everything is period, even today is of a period. You inform as much as possible, and I do that with imagery, be it painting, photograph, contemporary images that might have an essence of the story in them, images that capture what the story is about and how we want to present it. Then these images capture the mood and the essence of the story. Sometimes collating up to 5,000 references on a film, and they all go up on the wall!. These references might not all be “period” references, as long as they capture the moment of that scene or that sequence. In a way it’s like putting together a vocabulary or an alphabet. You have the building blocks of the film, and then you start refining which images you want to use and what becomes important, shaping the film you’re going to make, informing your decisions in the making of that film. Kirill: Do you stay within that particular time period when you design a set, or do you also go back in time? Sarah: I absolutely do go back. If you look at the way we all live in 2012, I don’t know about your house, but my house is full of things, some of them 400 years old and some are very contemporary. We don’t live in the moment. Very few people live in the moment. It’s interesting when you see somebody that does a film where they live in the arch of that moment, it might be correct for the character when it is. But if it isn’t, it becomes a fashion plate, interior decoration as opposed to film design. If you have a film set in 1950s, you’re recreating the ’30s because we had a war in between. 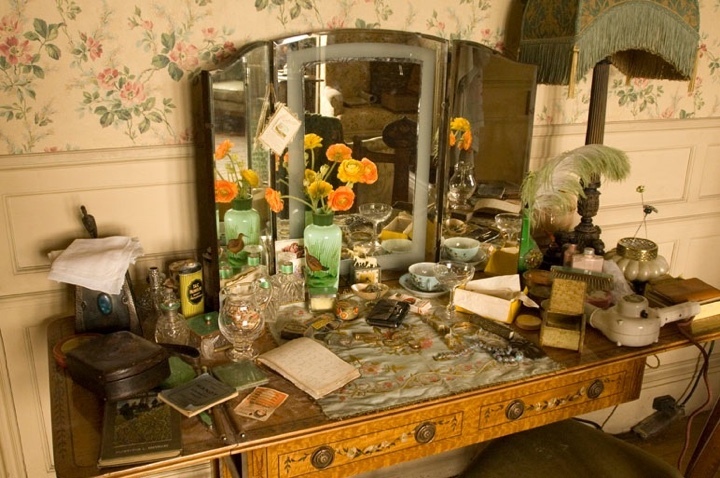 And if a film is set in 1930s, you probably would be recreating 1920s in their house. Certainly in that period people didn’t change their furnishings and their decor as much as we do today. They might be lucky enough if it changed when they married and moved, but it certainly didn’t change every year or every five years as we do now. It also has to do with wealth, whether you can afford to do it. You have to really look at the characters and the time, and how they would have lived. 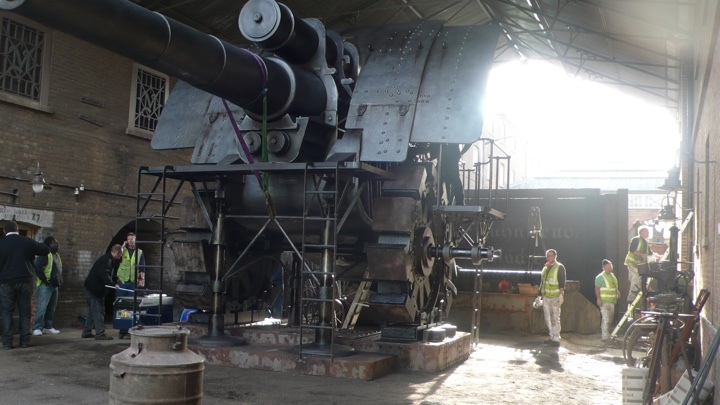 On the sets of “Anna Karenina”, courtesy of Sarah Greenwood. Kirill: So you extrapolate going back in time based on characters’ age, wealth and taste. Sarah: Absolutely. Take “Pride & Prejudice” for example. The Bennet household is a large family living in a rambling old estate. They might have been wealthy in land, but they didn’t have enough ready money to spend. So we gave them dated furnishings, flaky and aged paint treatment, creating a look of not having been kept up, almost neglect but mutely loved and mended. The farm encroaching right up to the back door, no decorative garden and pigs coming through the kitchen, all the furniture in the house was at least fifty to a hundred years older than the period we were in (making it incredibly expensive in todays Antique terms but just dated in Mrs Bennets eyes). We made the bed for Mrs Bennet and it was designed in the French style from mid 18th C,the time when she would have got married. It might have been her dowry, this beautiful bed when she had money at the time she married, but by the time we come to it in the film, it’s all frayed and broken, defining her and her raggedness from having five daughters and living life on the edge with having no money. Hence the reason why the whole family is so interested in money and marrying their daughters well because they couldn’t afford to keep them. On the sets of “Pride & Prejudice”, courtesy of Sarah Greenwood. And you contrast that with the Bingley household in “Pride and Prejudice” where all the furnishings in this rented house were absolutely state of the art. They were nouveaux riche, bang-on 1790s, with immaculate furnishings. We have the Bennet family joining that environment, and the girls sitting on the sofa, looking completely scruffy and out of place. There’s an example of how you use furnishings to back up the story. Even if our audience watching the film doesn’t know the ins and outs of the particular period, they get a sense of it from the look and feel. If it feels right, it means that it is right and therefore it’s working to tell the story. Sarah: It varies from director to director. I know Joe [Wright] so well after having worked on eight or nine productions with him. We work together very closely from the very early stage, even before he officially has the job. He’ll get me to read the script and we’ll talk about it, whether it’s a good piece to do. We work together and it’s great because it’s kind of funneling a lot of information. He then likes to come out on the initial scouts with me and location manager. He will definitely let what we’ve seen influence and inform the script if it is a location based film. That certainly happened a lot on “Atonement”, for example. What we saw certainly informed the ideas in the script. And then the DP [director of photography] comes on board, and I start on the physicality of achieving the ideas, building the sets and dressing them. By then I move on and start pushing outside a bit, and Joe gets into working with DP on storyboards and shots. I have never ever worked with a DP that has not brought much much more to the process. I always see the director and the DP onto new sets and obviously we talk about how the design works but once I’ve handed the set over to the shooting crew, I’m off to the next one build or dress, maybe at the other end of the country. I have nothing more to add, because if by then we don’t know what we’re doing or what the set is saying, it’s kind of a done deal. It only becomes better by what Joe and the DP and the actors bring to it. 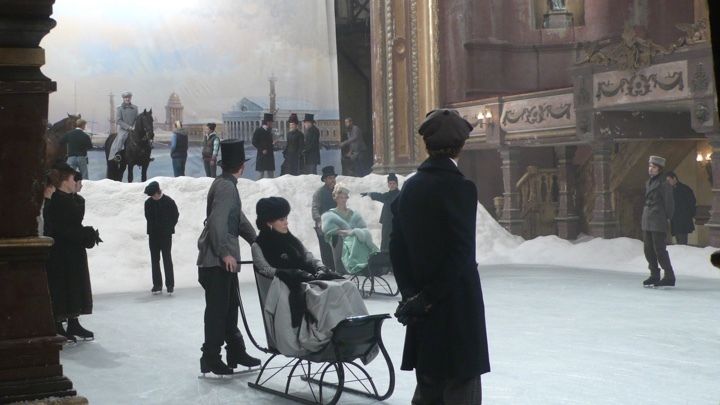 On the shooting set of “Anna Karenina”, courtesy of Sarah Greenwood. From the practical point of view in the UK we work with a stand-by art director, who works with both myself and Katie [Spencer, set decorator]. Katie also does all the props. It’s a different way of working than in the US. The stand-by art director will know everything about the set, how it works, what moves, what doesn’t move etc. She also does the continuity of all the props. If there’s anything that needs to be dressed on the day of the shooting, or the set needs to be moved on in time etc, we’ll go to it if we are about, but the stand-by art director is there in charge of the set. We are always in communication with Joe or whoever the director is about whether they want or need something. Once the DP,the cast and the shooting crew has taken over the set, I’ve never been disappointed with what has come out for the audiences in the end.Its synchronicity,we are greater than the sum of the parts! Kirill: Are you involved in the post-production phase? Sarah: More and more, as digital is becoming more integral to the whole design process. We’ve always done a bit, tidying things up etc. It’s been incredibly expensive up to this point. But I don’t necessarily wanting to do completely digital movies,however working on “Sherlock Holmes” we did more, and even more on the second, and it became another tool in our box really, which is great. As a methodology we do a lot of illustrations and visuals, I work closely with illustrator Eva Kuntz [http://www.evakuntz.com/]. This is an integral part of the information that we give to the VFX supervisor . As far as working after the principal photography – no. It hasn’t been a necessity up to this point, but I feel it’s going to become more so. By the end of principal photography, personally I’m kind of over it and ready to start something else. And up to this point I do think it’s something that I would certainly entrust to an art director – one who worked with us through the film and knows everything. Then I could keep in touch with it remotely and do what I do at the moment, which is to pop in to the edit once a week, or as and when. I think I wouldn’t want to tie myself to post-production wholly. I’m not sure I want to do films that have such a high degree of CG work, but were I to do a film like that, then it’s imperative for the production designer to be a part of that process. It’s the look of the film, it doesn’t matter how it is achieved with a physical paintbrush or a digital paintbrush. You are responsible for the look of the film and that’s your job. Kirill: Do you have a favorite phase of the overall production arc? Sarah: I like the day I get the job and then the day I finish (laughs). I enjoy all periods of it, I must say. I love it at the beginning when you’re researching, it’s an anxious and stressful time,but it is when everything is possible and you can do anything and create a world, literally. 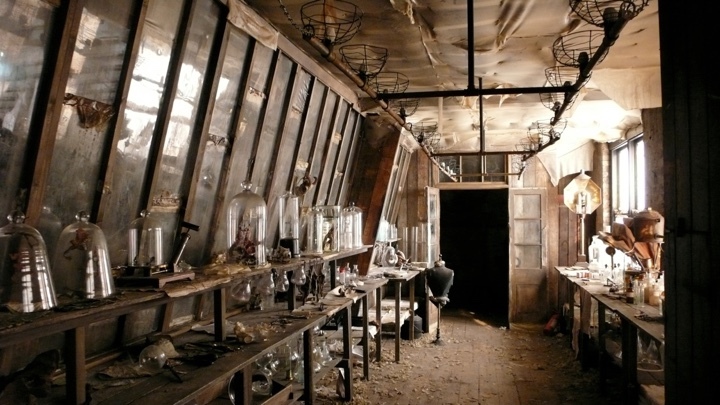 And then it gets towards shooting, and the money’s running out and time’s run out, and that’s when the problems arrive and you say “Oh my God,we are never going to get through it.” But once you start shooting all is well, that’s always good, and that’s what I love about the location filming in particular. You’re moving on, and you have a hundred sets in your schedule, and you’re ticking them off. And then halfway through you have maybe forty sets, and then towards the end you got three, it’s fantastic, and then you’re done and that’s wonderful. By the end of each film you’re run ragged and exhausted. Thats why going into major post production would be a challenge as you would have to look at the pacing of the whole film. Sometimes you have massive sequences at the end, like on “Atonement”. 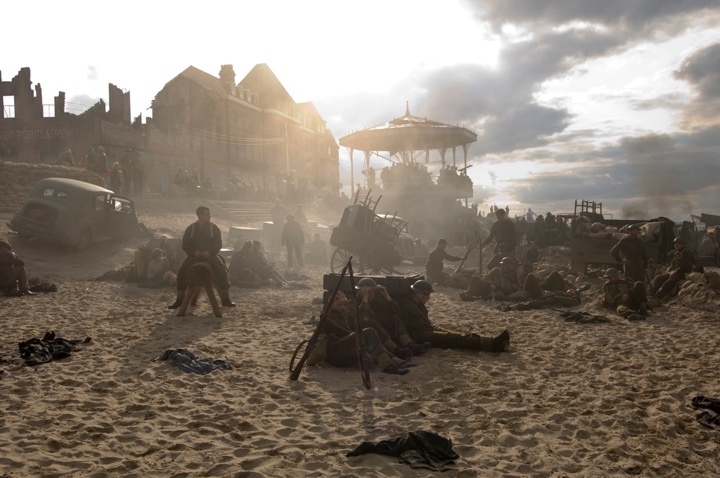 The last three days were the beach sequence at Dunkirk, the biggest sequence in the whole film. We needed to keep up huge energy levels and keep the money ring fenced to achieve that. Kirill: As you’ve mentioned “Atonement”, I usually ask about how you ended up working on a particular film. But it was not your first collaboration with Joe Wright. Can you talk about how different it is to work with the same director on multiple productions, as opposed to working with a new director for the first time? Sarah: I work with Joe a lot, on almost every other film. As when he’s editing and doing post, I’m onto another film. It’s good for he and I to have these breaks, but it’s equally lovely to go back to Joe because he’s a fantastic director to work with. We do occasionally scrap, like brother and sister! but he’s so brilliant. And having that shorthand and that knowledge of each other and the same with the of our whole team -Its one big dysfunctional family, since so many of us work together so often – is great and it allows us the confidence to be brave. I don’t know if we could have done “Anna Karenina” in the way that we’ve done it had we not all worked together and not known each other so well. As far as working with new directors, it’s challenging. I’m starting at the moment working with David Yates who did the last four “Harry Potter” movies, we are doing the development on “Tarzan”. It’s interesting working with someone new. David is a really nice guy and it’s exciting for me to work with someone new as they challenge me in different ways and hopefully it’s exciting for David to work with someone new because it’s a different way of working and a different approach. Although for me to step into Stuart Craigs shoes here is very daunting, he is such a hero of mine. We should look at it as refreshing, a creative brain wash, a new way of working. Ultimately we all go to the same end. However there are certain Directors that I wouldn’t like to work with. The most important thing about your job is that you love doing it. It’s a very hard job and it takes a lot out of you and your life, and if you don’t enjoy doing it there is really no point in doing it. It is a job that has got to give you so much and you have to give it your all to create the satisfaction. Therefore working with new people, as long as you choose them and they choose you carefully, you will get on and it will be a happy creative process. External set sketch for “Sherlock Holmes”, courtesy of Sarah Greenwood. Kirill: Does it also involve actors? Sarah: To some extent we have the least to do with actors among all the behind-the-camera crew. Costume, make-up, DP are with them all day. 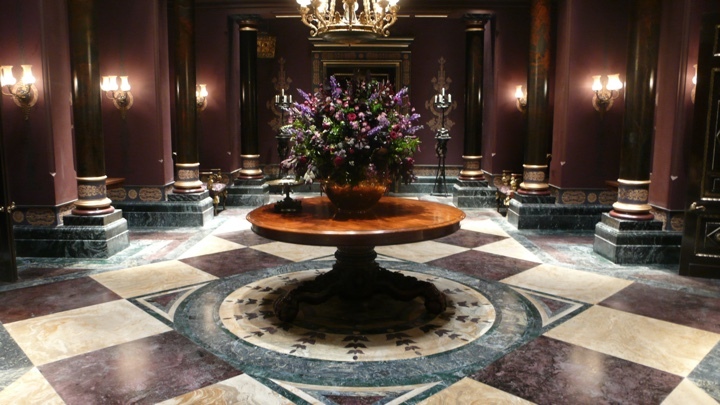 The production designer has the least to do, because you do the sets and then you move on and move on. But Joe is very inclusive, and we are all this big family. We do get to know the actors really well. Joe creates a very egalitarian atmosphere on set , and we’re all allowed in there. You get to know the actors looking at the costume concepts, for example. This is the third time I’ve worked with Keira [Knightley], I know her and Jude [Law] having worked with him on both “Sherlock Holmes” before “Anna Karenina”. You do get to know them, but I wouldn’t say that you know them like the costume designer or make-up designer knows them. 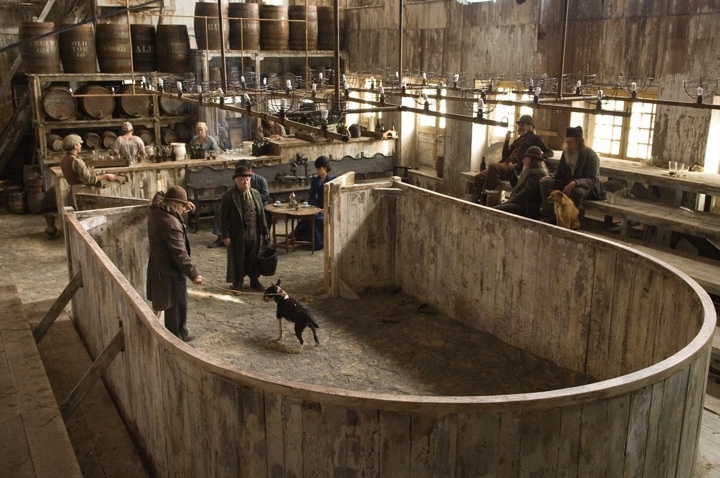 Kirill: Do you find yourself designing the sets around the particular physical presence of specific actors? Sarah: No, not from the actors’ point of view. They embody the characters of the script, so you design for the characters. It’s great when you know who you’re designing for, so in a way designing the second “Sherlock Holmes” was easier than the first because you know Jude and Robert and how they are interpreting the characters of Holmes and Watson, what they like, how physical they are etc. So that comes into play. And equally you know what Keira looks good against – actually she looks good against anything, actually – she will still look fantastic against a black wall!! Keira Knigthley in “Anna Karenina”, “Edge of Love” and “Atonement”. Kirill: Going back to “Atonement” which is this very impressive productions in terms of its scope and visuals. Was it a big budget? Sarah: It wasn’t a big budget. It was about $25M or $30M dollars, and it was kind of three films in one. You had London, and then you had the war sequence, and the whole pre-war sequence. It was quite an epic ask, actually. There were certain battle sequences that were cut completely. The sequence where you have these three guys walking through the country side was originally supposed to be the retreat of 15,000 men from Dunkirk. We decided that we didn’t have the money or the resources to achieve both that and the beach, so we put all the resources into the beach sequence. In the end we just had the three guys on their own. And you know, out of these financial problems you get the best creative solutions. That was the case of it working so well in our favor. Country side scene in “Atonement”, (left) overhead set shot courtesy of Sarah Greenwood, (right) final still. As far as the sequence on Dunkirk beach goes, a lot of people say that shot was a bravado shot. In a way it turned out to be, but it wasn’t intended to be. That whole sequence was going to be shot as a series of montages and only a couple of days before we realized that we had a 1,000 extras for two days, and we had the tide coming in and going out. So we were brainstorming and decided to shoot this as a single sequence. Kirill: So that single take was rehearsed and completed in two days? Sarah: It was rehearsed on the first day when the tide was out, and then the following day again when the tide was out we filmed it. The sequence is over five minutes, and we shot it in three and a half takes because Peter Robinson who was the stedicam operator who although he was on the back of the jeep for the first minute or so, and after that he’s walking on sand with a Steadicam. It was exhausting, absolutely exhausting. The extras were the local steel workers,we were filming it in this town on the north-east coast of England. They weren’t film extras, and to rely on them not to look at camera – the choreography was massive. Everybody just pulled together and we didn’t know if we got it on that final take, because the connection between the camera and the video had gone. By that point Peter collapsed and the light had gone, the tide was coming in (laughs) – so that was it. We just hoped that we had it. We did a lot of safety shots, we could surround it but we wouldn’t be the shot that it was. We didn’t know until the rush had come in that day that we actually achieved it, which was fantastic. Dunkirk beach scene, sketch. Courtesy of Sarah Greenwood. On the set of Dunkirk beach scene, courtesy of Sarah Greenwood. Kirill: You mentioned that there are three almost separate parts of “Atonement” – the pre-war house, wartime London and the war sequences. What are the logistics of searching for and acquiring materials for these big sets? Sarah: The hospital set in the wartime London was built. Katie Spencer [set decorator] and her team found most of it all in various prop companies and junk shops, then cleaned it all up and had it repainted for the uniformity. They might not have matched perfectly, but unless you saw them next to each other, you kind of got away with it all. It was a very massive job from set decorator department to achieve that. A certain amount we got made, like all the bed drapes, and the metal frames for hanging the beds drapes, things like that. It was this massive detective search to achieve it all . Kirill: And then it’s all gone. Is it sad for you to see them gone, or by the time it’s done you don’t want to ever see it again? Sarah: Walk away – I love that. You’re so sick of it. I am actually sick of it by the time the shooting crew comes on set, I train myself to let go because you’ve nursed the set sometimes for months to get it built and dressed, and then you see them in their size 10 boots walking all over it. As much as nowadays people are much more respectful of sets, they still they come in and say “OK, let’s take that wall out, let’s do this and let’s do that” and it all gets moved out (which is of course the filming process!). That’s why I walk away . And when the time comes to actually take the set out, I’ve already let go of it and moved on. And you will always have the sets there on film. Interestingly, when you look back on the films that you’ve done and you haven’t seen for a couple of years – I just caught “Atonement” on TV the other day – it was “Wow, I completely forgot we did all of that.” It’s great, it’s there if you want it. Family house set in “Atonement”, courtesy of Sarah Greenwood. Actors on the family house set in “Atonement”, courtesy of Sarah Greenwood. Kirill: So the pain washes away with the time, and you’re left with only the nice memories. I love it, because I’m close to Joe and I go into the edit and I see a lot of rough cut versions. I love it when you go and see something, and it turns out to be so much better than you thought. You think and hope and pray that it is going to be good, and it turns out to be good, it’s fantastic, it’s a great feeling. There’s only one film that I’m actually ashamed of, and when you see a film that you’ve done and you say “That’s a good one, we made a bloody good effort at that,” and of course the critics forget the angst and the pain and the lack of money or time or whatever happened to achieve what you’ve achieved. We just get through it by the skin of our teeth. If you push it, if you challenge it and you try to get the most out of it, then you will end up with something generally quite exciting. Kirill: Are you eager to hear what the public and the critics think about your films? Sarah: Yes and no. I read some reviews. You hope that people do enjoy it, and I get very defensive or upset if I feel something is being unfairly commented on, or particularly somebody’s performance. In the UK they are particularly snide about Keira sometimes, which is a shame. Sometimes I know the film and its flaws, and when you have a review that picks out what is good and bad about it, then it’s “Yeah, great, well done, you got it.” And equally if a film is rubbish, and is being called out for being rubbish, that’s fine as well. Equally, the post-production and editing take so long that you’re generally right in the middle of another film and suddenly there’s the cast and the crew and it’s “Ah, right, yeah”. Kirill: That brings me to my next question. You worked on “Anna Karenina” last winter, and with post-production and whatever the marketing reasons the studio has in mind, the movie is now starting its global theatrical release. Is it gone from your memory in between? Sarah: Yes and no. Joe is a friend and I keep in touch through the editing and post-production. I do go to the friend and family screening, as Joe likes us to come in and have a look and give comments on it before it goes to general release. And then on “Sherlock Holmes” with Guy Ritchie we met with VFX and watched sequences. It’s always a shock to see the final film, because the music and the sound edit are so crucial and critical. But It’s always brilliant when you actually see it finished. And I’m always amazed, and not that I could ever do it, but if I was anything else in the film business, I’d be an editor. What they do with editing is just mind-boggling. How can you turn a film that is so-so into a film that is amazing with a bit more editing. What on Earth do they do in that process, it’s like alchemy. You take a piece here and you add a piece there and suddenly the whole mood of the scene changed. I find that fascinating, that final edit process really interesting. Kirill: Can you talk a little bit about the award season and how that goes on the side of the voting? Sarah: I am a voting member of BAFTA and the Academy. It’s interesting when they say “Oh, the Academy didn’t vote for this movie this year, because it’s not on the Academy’s cut of things,” but that’s weird. We’re all individuals, five thousand people that can vote and therefore five thousand individual votes. I talk to my friends about films, but I don’t discuss it as a ‘group thing’. You have your individual vote, and that’s all you have. And so what you do is you watch films, as many as you can, you have opinions and you vote accordingly. On the set of “Sherlock Holmes”, courtesy of Sarah Greenwood. Kirill: When you watch a movie for the purpose of deciding which one you’re going to vote for in a specific category, is it hard to separate the pleasure of being immersed in the story from the business of looking at the particular technical aspects? Sarah: When it works, it’s a pleasure. You’re kind of aware of it. When I go and see a movie, I really hope that I’m just going to enjoy it as a movie. There are certain things that I’m not qualified to comment on, like sound mixing, but you are aware when the sound is amazing even if I don’t know enough about it. It tends to only be bad choices when I notice it, and I really hate it. It kind of takes you out of what you’re watching – when you start to critically notice it. That is generally when it’s not working. Equally, I love films that are extreme in their design as much as films that are subtle in their design. I have my personal taste, but equally I can recognize something that might not be my personal taste but I think is a fantastic piece of design. And then I’ll be envious of it because I can never do that, but equally it’s incredible and I’m very very impressed with it. Something like “Avatar” – I could never design in a million years and therefore it’s impressive and incredible, but it’s not the kind of thing that I would do or want to do. But I recognize it for the success that it is. So it certainly doesn’t distract me. And there comes a day when you’re designing something, and I look back on other movies and remember a fantastic scene that captured the essence. 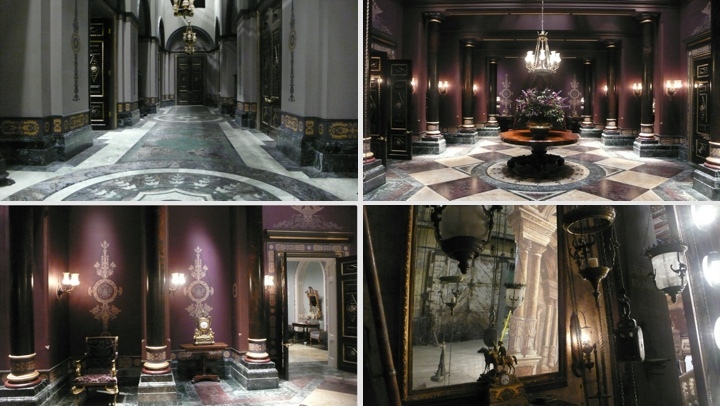 In my mind that’s the nature of production design – a lot of plagiarism. You do take ideas from everywhere, from everything. Kirill: Let’s talk about digital and stereo productions. How is your job changing with these tools available to you and your directors? Sarah: We were going to do the last “Sherlock Holmes” in 3D, but didn’t in the end. It was mainly for time reasons. When Guy Ritchie was told that the schedule will be half as long again, he stopped that. It’s also a period movie, so why would you? These are tools, as you said, and they’re there. There are amazing and fantastic tools when it comes to set extensions, to make our world just a little bigger. I don’t think that I would be interested in creating world completely digitally. I like tangible things, I like lighting, texture and atmosphere that digital world doesn’t have. Things that are made in CG world are more fantastical, and I think that it’s not necessarily the kind of film that I’m interested in making per se completely. But it doesn’t mean to say that I’m not interested in what the digital technology can do for enhancing the films that I might be involved in. It’s interesting when you look at the “Atonement” beach scene, a lot of people say that the beach scene was all CG, and in fact none of it was CG (except for some crowd replication in the water). It was all real, the Ferris wheel and everything. But, if we were making it now, it probably would be CG and it stops being so incredible and amazing. And you’re aware that our audiences are not won over by CG worlds because it’s kind of easy. I have teenage kids, and they say “Oh well, it looks like a computer game world, what’s so special about that?” And a film with real drama and real people and real environments – those are the films that the kids are watching now, it’s kind of a full circle. On the sets of “Sherlock Holmes”, courtesy of Sarah Greenwood. Kirill: But if the Ferris wheel was real on the set six years ago, and it’s created in CG in post-production today and they look the same on screen, then the only difference is the physicality on the set. Sarah: To my mind, if we had done the whole background in a digital world, we would have shot it differently. It would have been a very different shot. It would create a world with only a hundred extras that we knew the camera would get close to to interact with. We’d never design that shot, the whole thing was that it came out of the physicality of that set, and that moment, and that tide, and that light and everything. If you knew that you were going to do it digitally, you’d’ve done something massive and bigger. Instead of having a thousand people on the beach, you’d have a hundred thousand. But having a hundred thousand CGI people on the beach doesn’t make it better at all, actually. What made that shot work was the human drama, and the pain, and every little moment of that sequence told a story. And that was the combination of everything being there on that day, on that moment of the day, of Joe designing to shoot that way, the light and everything just happened to fall into place well. It could’ve been torrential rain and zero visibility, but if you’d not even attempted it and said that you’d do it in CGI, you would’ve ended up with a very different moment in the film. You maybe would’ve lost the audience. Kirill: And even with the blockbuster success of CGI-driven movies such as “Avatar”, “Harry Potter” or “Lord of the Rings”, people still go to the theaters to watch movies such as “Atonement” or “Anna Karenina”. Sarah: It’s what they call “adult drama”. There was a real backlash against it two or three years ago, but “King’s Speech” kind of brought it back again. I think that the important thing is to have a very good story. It’s the story that counts. If it happens to be period, then fine. But it’s the story that is everything. There are some fantastic stories being written today, amazing films to be made out of them because they are such fantastic stories. There’s such good writing, and of course we have such good classic literature. I was listening to the radio the other day, and there was a new adaptation of “Dracula”. And just listening to that on the radio, it was fantastic and so scary. You’ve now got all these slasher horror pics which are just so dull, while this remake of “Dracula” was so amazing. That is an amazing story, and you wouldn’t make it because it happens to be in 1870, but you make it because it’s an incredible story that happens to be set in 1870. That’s what makes it interesting. We had the Benedict Cumberbatch’s version of “Sherlock Holmes” on BBC. It’s really amazing, and it’s updating Sherlock, an amazing piece of drama. The most important piece is the script, and if it’s well-written I think then there’s a real place for grown-up drama. On the set of “Sherlock Holmes: A Game of Shadows”, courtesy of Sarah Greenwood. Kirill: Would you want to recommend a film or two that you’ve particularly liked over the years? Sarah: It depends on your mood. From the design point of view, one of my favorite movies is “The Name of the Rose” which Dante Ferretti designed. That was the film that completely made me aware of film production design and its potential. That is an incredible film. But I watch all sorts of films, it’s the most amazing medium. And I can’t wait to see “Skyfall”. I’d love to do a Bond. To my mind you hark back and pay homage to the work of Ken Adam, what he did on the original films. We’ve just had all the Bond movies as a season on the television, and we’ve watched some of them back to back, and the design of early Bonds is just out there, just incredible. And here I’d like to thank Sarah Greenwood for bringing us these wonderful films and taking time to answer my questions, and Katie Spencer for putting me in touch with Sarah. “Anna Karenina” is in theaters now.